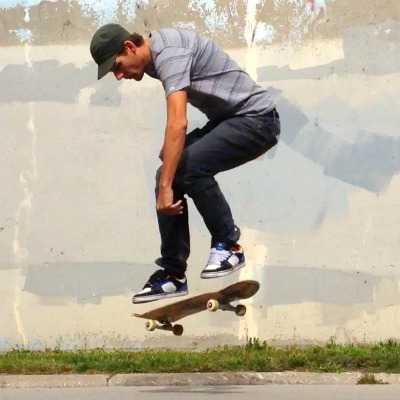 Pop Shuvit - A flat board spin while doing an ollie. This trick can spin 180, 360, 540 or more. Do the backside version first. It is much easier. A pop shuvit should be the first ollie trick you do where the board leaves your feet. This is a new thing to get used to. It will take time to learn the board control. You need to be able to ollie about 6"[150mm] to do this trick. That gives time to let the board rotate while you are in the air. You also need to be able to flick a backside shuvit. That is without the pop. The scooping motion is vital for this trick. To practice the scooping motion stand next to the board and slap and scoop the tail with just your back foot. You show be able to pop and catch the board 180 with just the back foot. With your front foot lined up with the toe edge at a 30-degree angle. Line up your back foot with the curve of the tail and angled 10-degrees out. When you pop the ollie you need to scoop back your back foot and move your front foot slower and level. You want to avoid causing the board to flip. The back foot does most of the work. The board should rotate 30-degrees by the time the tail hits the ground. Once in the air pull your feet up and out of the way. Just float and enjoy this trick. When the board has rotated almost 180-degrees throw your feet at it and catch it. You need to practice putting your feet to the board. This will become second nature after a while. Once you catch it you can land and roll away. Same steps plus a few more. Your front foot should be perpendicular with the toe hanging off a bit. Your back foot should be perpendicular and pulled back an inch or so from the curve of the tail. When you pop the ollie you need to scoop forward your back foot and move your front foot back slower and level. You want to avoid causing the board to flip. The back foot does most of the work. The front foot keeps this flat and gets out of the way. When popping you want to jump backward to stay over the board. Once in the air pull your feet up and out of the way. You can't see the board well in this trick so just go with it. Like any fakie flip trick popping a shuvit fakie will spin easier but be harder to control. Use only one-quarter of the flick to get the board around. Fakie pop shuvits are a subtle trick.